In this Discovery Channel series, a slice of Los Angeles has been set up to mimic the total desolation that is expected to follow an apocalyptic disaster. Ten participants have been dropped into this urban wasteland, each bringing his or her own set of strengths, biases and beliefs. There are some unique and strong individuals: Vladimir is a haunted ex-soldier who likes to cook and to dance, Leilani is a self-defence instructor who doesn’t know how to back down from a confrontation, and Mike, if you can get past his caustic hair-bristling exterior, is a pragmatic inventor and problem-solver. These individuals bring with them a mix of brawn, intellect and natural instinct. A large part of the appeal of a show such as this is watching the team come together to solve problems. At times it seems nothing is beyond this group; between Mike’s fabricating skills, Joey’s grit and John C’s imaginative brilliance, they look like they’re capable of overcoming any challenge. But of course, the machine isn’t always so well oiled. Personalities come to the fore more than once, and the immaturity, squabbling and lack of cohesion between certain people regularly threatens to fracture the group. Throw into the mix a bikie gang, whose goal it is to unnerve the group as well as to steal supplies and harass them at every opportunity, and it makes for an interesting set up with some exciting possibilities. Each of the ten episodes has its own theme, which usually takes the form of a problem that the group will have to solve. In the first week they’ll need to work out how to filter water from the poisonous Los Angeles river, and in subsequent episodes they’ll be challenged by food shortages and the problem of supplying power to the colony. Often arising from these pressures are more human and ethical dilemmas. On more than one occasion the colonists are forced into hard choices, such as whether or not to kill captured goats for some much needed protein or keep them for their milk, or whether to hand out their dwindling supplies of food to other suffering survivors. I suppose the only real problem with ’The Colony’ is the fine line it walks between factual experiment and fictional script. The colonists and their reactions are real, but sometimes the situations they find themselves in feel forced. Always in the background you can sense the prodding influence of the show’s producers, guiding events along a path that makes for suitable and entertaining television viewing. It would have been more interesting had things been allowed to evolve more naturally. When Marauder leader Andre breaks into the compound to steal food, he seems determined to announce his presence to the colonists. It makes for dramatic television, but as a real-world act it doesn’t make much sense. 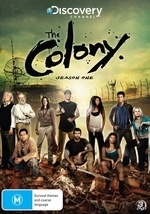 As a show, The Colony has the mass-produced look of other Discovery Channel programmes. There are interjections by experts, a fairly standard musical soundtrack, and a voice-over by the prolific Thom Beers (who sounds more like John Wayne than ever). If you’ve seen Ice Truckers, Ax Men or Deadliest Catch then you’ll know what to expect from the show’s look, sound and layout. Sometimes it feels like you’re watching an urban version of Survivor, but thankfully the moments of forced drama are kept to a manageable level. The Colony wasn’t made to shatter your world view and it won’t- it’s light entertainment. If you delve into the Colony knowing that, and have an interest in post-apocalyptic themes or how things work, then you’ll find plenty to like.